The Club is open to both ladies and gentlemen. During the summer months (May to September) the club plays outdoors and its home rinks are in Chancellor Park, Chancellor Avenue, Chelmer Village MC2 6WS. The principal meeting of the week is usually on Saturday afternoon but the members also meet for practice "roll-ups" on Wednesday afternoons and Thursday evenings. Members enter for a variety of in-house competitions for which trophies are awarded annually. 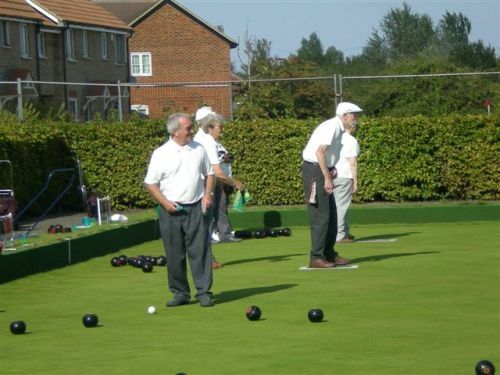 The Club has a team of eight players entered in the Chelmsford Mid- week League and this involves fourteen highly competitive matches played on Tuesday evenings. 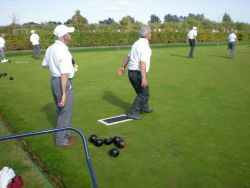 Some members also enter singles and pairs competitions under the auspices of this League. 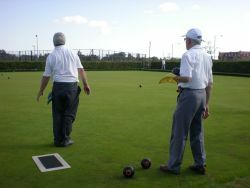 The Club was founded in the eighties by George Brown and the George Brown Memorial Shield is competed for outdoors annually by the Trinity and Hall Street Bowls Clubs. For further information - please contact Jan or Phil Roberts on 01245 226832.